Dee straddled the worlds of science and magic just as they were becoming distinguishable. One of the most learned men of his time, he had lectured to crowded halls at the University of Paris when still in his early twenties. He was an ardent promoter of mathematics, a respected astronomer and a leading expert in navigation, having trained many of those who would conduct England's voyages of discovery. (He coined the term "British Empire.") At the same time, he immersed himself deeply in Judeo-Christian magic and Hermetic philosophy, devoting the last third of his life almost exclusively to these pursuits. For Dee, as with many of his contemporaries, these activities were not contradictory, but particular aspects of a consistent world-view. Dee was born in Tower Ward, London to a Welsh family, whose surname derived from the Welsh du ("black"). His father Roland was a mercer and minor courtier. Dee attended the Chelmsford Chantry School (now King Edward VI Grammar School (Chelmsford), then - from 1543 to 1546 - St. John's College, Cambridge. His great abilities were recognized, and he was made a founding fellow of Trinity College. In the late 1540s and early 1550s, he travelled in Europe, studying at Leuven and Brussels and lecturing in Paris on Euclid. He studied with Gemma Frisius and became a close friend of the cartographer Gerardus Mercator, returning to England with an important collection of mathematical and astronomical instruments. In 1552, he met Gerolamo Cardano in London: during their acquaintance they investigated a perpetual motion machine as well as a gem purported to have magical properties. Dee was offered a readership in mathematics at Oxford in 1554, which he declined, citing English universities' emphasis on rhetoric and grammar (which, together with logic, formed the academic trivium) over philosophy and science (the more advanced quadrivium, comprised of arithmetic, geometry, music, and astronomy) as offensive. In 1555, Dee became a member of the Worshipful Company of Mercers, as his father had, through the company's system of patrimony. That year he was arrested and charged with "calculating" for having cast horoscopes of Queen Mary and Princess Elizabeth; the charges were expanded to treason against Mary. Dee appeared in the Star Chamber and exonerated himself, but was turned over to the reactionary Catholic Bishop Bonner for religious examination. His strong and lifelong penchant for secrecy perhaps worsening matters, this entire episode was only the most dramatic in a series of attacks and slanders that would dog Dee through his life. Clearing his name yet again, he soon became a close associate of Bonner. 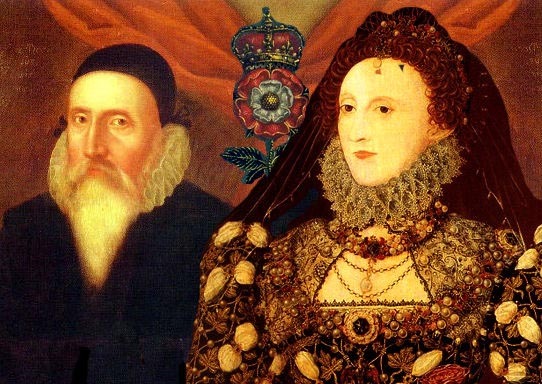 When Elizabeth took the throne in 1558, Dee became her trusted advisor on matters astrological and scientific, choosing Elizabeth's coronation date himself. From the 1550s through the 1570s, he served as an advisor to England's voyages of discovery, providing technical assistance in navigation and ideological backing in the creation of a "British Empire", and was the first to use that term. In 1577, Dee published General and Rare Memorials pertayning to the Perfect Arte of Navigation, a work that set out his vision of a maritime empire and asserted English territorial claims on the New World. Dee was acquainted with Humphrey Gilbert and was close to Sir Philip Sidney and his circle.  Dee's first attempts were not satisfactory, but in 1582 he met Edward Kelley, who impressed him greatly with his abilities. Dee took Kelley into his service and began to devote all his energies to his supernatural pursuits. These "spiritual conferences" or "actions" were conducted with an air of intense Christian piety, always after periods of purification, prayer and fasting. Dee maintained that the angels laboriously dictated several books to him this way, some in a special angelic or Enochian language. In 1583, Dee met the visiting Polish nobleman Albert Aaski, who invited the Englishman to accompany him on his return to Poland. With some prompting by the angels, Dee was persuaded to go. Dee, Kelley, and their families left for the Continent in September 1583, but Laski proved to be bankrupt and out of favor in his own country. Dee and Kelley began a nomadic life in Central Europe, but they continued their spiritual conferences, which Dee recorded meticulously. He had audiences with Emperor Rudolf II and King Stephen of Poland in which he chided them for their ungodliness and attempted to convince them of the importance of his angelic communications. He was not taken up by either monarch. During a spiritual conference in Bohemia in 1587, Kelley told Dee that the angel Uriel had ordered that the two men should share their wives. Kelley, who by that time was becoming a prominent alchemist and was much more sought-after than Dee, may have wished to use this as a way to end the spiritual conferences. The order caused Dee great anguish, but he did not doubt its genuineness and apparently allowed it to go forward, but broke off the conferences immediately afterwards and did not see Kelley again. Dee returned to England in 1589. Personal life - Dee was married three times and had eight children. His eldest son was Arthur Dee, about whom Dee wrote a letter to his headmaster at Westminster School which echos the worries of boarding school parents in every century; Arthur was also an alchemist and hermetic author. John Aubrey gives the following description of Dee: "He was tall and slender. He wore a gown like an artist's gown, with hanging sleeves, and a slit.... A very fair, clear sanguine complexion... a long beard as white as milk. A very handsome man." Final years - Dee returned to Mortlake after six years to find his library ruined and many of his prized books and instruments stolen. He sought support from Elizabeth, who finally made him warden of Christ's College, Manchester in Manchester (now Manchester Grammar School) in 1592. However, he was by now widely reviled as an evil magician and could not exert much control over the Fellows, who despised him. He left Manchester in 1605. 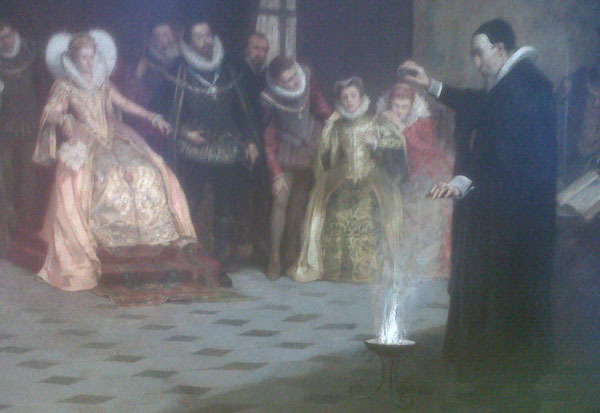 By that time Elizabeth was dead, and James I, unsympathetic to anything related to the supernatural, provided no help. Dee spent his final years in poverty at Mortlake, where he died in late 1608 or early 1609. Unfortunately, both the parish registers and Dee's gravestone are missing. Dee was an intensely pious Christian, but his Christianity was deeply influenced by the Hermetic and Platonic-Pythagorean doctrines that were pervasive in the Renaissance. He believed that number was the basis of all things and the key to knowledge, that God's creation was an act of "numbering". From Hermeticism, he drew the belief that man had the potential for divine power, and he believed this divine power could be exercised through mathematics. His cabalistic angel magic (which was heavily numerological) and his work on practical mathematics (navigation, for example) were simply the exalted and mundane ends of the same spectrum, not the antithetical activities many would see them as today. His ultimate goal was to help bring forth a unified world religion through the healing of the breach of the Catholic and Protestant churches and the recapture of the pure theology of the ancients. About ten years after Dee's death, the antiquarian Robert Cotton purchased land around Dee's house and began digging in search of papers and artifacts. He discovered several manuscripts, mainly records of Dee's angelic communications. Cotton's son gave these manuscripts to the scholar Meric Casaubon, who published them in 1659, together with a long introduction critical of their author, as A True & Faithful Relation of What passed for many Years between Dr. John Dee (A Mathematician of Great Fame in Q. Eliz. and King James their Reignes) and some spirits. As the first public revelation of Dee's spiritual conferences, the book was extremely popular and sold quickly. Casaubon, who believed in the reality of spirits, argued in his introduction that Dee was acting as the unwitting tool of evil spirits when he believed he was communicating with angels. This book is largely responsible for the image, prevalent for the following two and a half centuries, of Dee as a dupe and deluded fanatic. Around the same time the True and Faithful Relation was published, members of the Rosicrucian movement claimed Dee as one of their number. There is doubt, however, that an organized Rosicrucian movement existed during Dee's lifetime, and no evidence that he ever belonged to any secret fraternity. Dee's reputation as a magician and the vivid story of his association with Edward Kelley have made him a seemingly irresistible figure to fabulists, writers of horror stories and latter-day magicians. The accretion of false and often fanciful information about Dee often obscures the facts of his life, remarkable as they are in themselves. His personal library at Mortlake was the largest in the country, and was considered one of the finest in Europe, perhaps second only to that of de Thou. As well as being an astrological, scientific and geographical advisor to Elizabeth and her court, he was an early advocate of the colonization of North America and a visionary of a British Empire stretching across the North Atlantic. Dee's most long-lasting practical achievement may be his promotion of mathematics outside the universities. His "Mathematical Preface" to Euclid was meant to promote the study and application of mathematics by those without a university education, and was very popular and influential among the "mecanicians": the new and growing class of technical craftsmen and artisans. Dee's preface included demonstrations of mathematical principles that readers could perform themselves. He has often been associated with the Voynich Manuscript. Wilfrid M. Voynich, who bought the manuscript in 1912, suggested that Dee may have owned the manuscript and sold it to Rudolph II. Dee's contacts with Rudolph were far less extensive than had previously been thought, however, and Dee's diaries show no evidence of the sale.